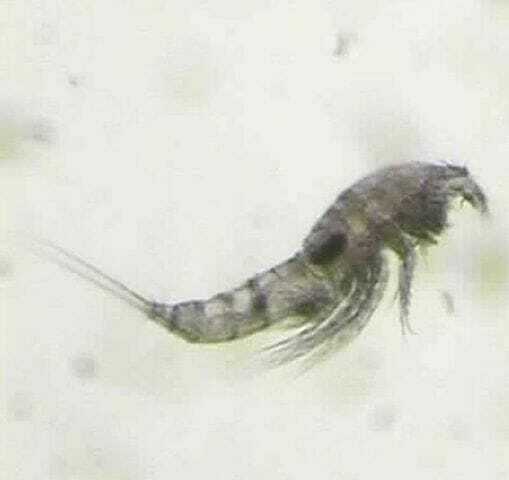 The term copepod is used to describe small crustacean species that are found in the majority of aquatic environments. Copepods can be found in both the upper waters and bottom of oceans and freshwater bodies, as well as swamps, bogs, ponds, and other wet habitats. Copepods constitute an important zooplankton species. The copepod lifecycle is similar to that of other crustaceans. The lifecycle begins with an egg that hatches into a larval form that contains a head and tail without a defined abdominal region, known as the nauplius (shown below). After several rounds of molting, the larva achieves adulthood. Adult reproduction is dictated by seasonal cues and the relative abundance of nutrients. Moreover, the presence of environmental toxins and water quality have also been found to alter copepod reproduction and development. Copepod size varies from 2 mm to 1 cm in length. The body of copepods is teardrop-shaped, contains a thin, almost transparent exoskeleton, and two pair of antennae (shown below). Copepods lack a circulatory system and gills. Instead, oxygen is absorbed directly via the skin. Waste products are excreted via specialized maxillary glands. The copepod body consists of several segments: 5-7 thoracic segments, upon which the head and limbs attach and an abdomen, which is devoid of limbs but can form a tail-like structure. The shape and size of the body is highly variable depending on the specific species. Most copepods contain one centrally-located compound eye; however, some species lack an eye. Specialized thoracic appendages called maxillipeds are used for feeding. Copepods residing near the surface of large water bodies typically consume phytoplankton or other copepod species. Species residing on the ocean floor or other similar habitats have specialized mouth parts that are capable of scraping organic waste products and associated bacteria for consumption. 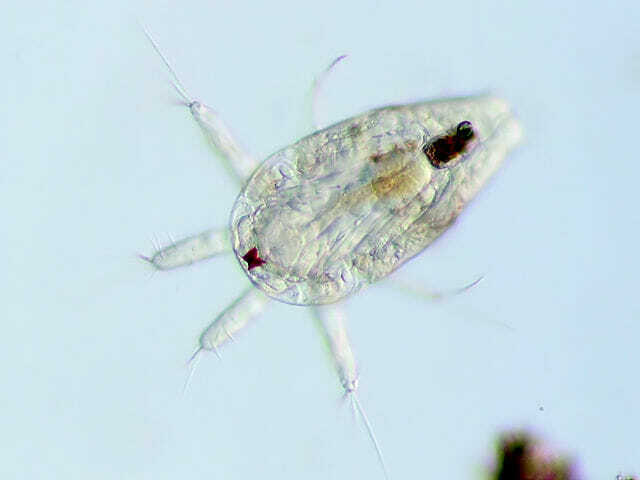 Other copepods are parasitic species and will derive nutrients from a host (shown below). Some copepods feed on insect larvae and are being tested for their ability to control mosquito populations in regions affected by mosquito-transmitted diseases (e.g., dengue). A. A singular red eye found on copepods. B. A specialized eating appendage. C. The larval form of a copepod. D. A type of parasitic copepod. C is correct. A nauplius refers to the larval form of copepods. 2. Which of the following statements is NOT true about copepods? A. Many copepods consume phytoplankton. B. Copepods are generally small but are highly variable in size. C. Copepods lack both a defined circulatory and respiratory system. D. Copepods live in a wide range of habitats from swamps to arid deserts. D is correct. Copepods inhabit aquatic environments and would not survive in an arid desert climate. Groner et al. (2016). 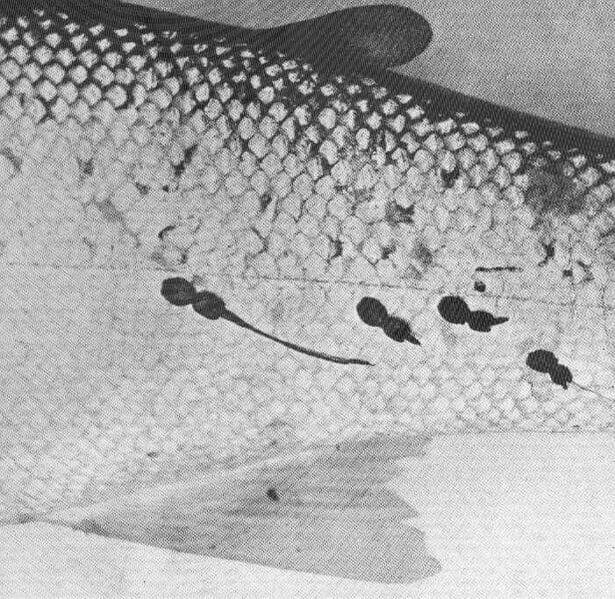 Lessons from sea louse and salmon epidemiology. Philos Trans R Soc Lond B Biol Sci. 5;371. Harrison, JF. (2015). Handling and Use of Oxygen by Pancrustaceans: Conserved Patterns and the Evolution of Respiratory Structures. Intergr Comp Biol. 55(5):802-15. Yen, J. (2000). Life in transition: balancing inertial and viscous forces by planktonic copepods. Biol Bull. 198(2):213-24.